Get out your bucket list. Travel + Leisure gave explorers a sneak peek at its 2010 World's Best Awards recently, ranking everything from hotels to airlines to rental car agencies to best cities to visit both abroad and in the U.S. and Canada. The top North American city to visit was New York, followed by San Francisco, Charleston, South Carolina and Chicago. New Orleans returned to the list -- as number 7 -- for the first time since Hurricane Katrina devastated the city in 2005. Despite the recession and the negative publicity surrounding the ongoing Deepwater Horizon oil spill in the Gulf of Mexico, hotels and restaurants in the Big Easy are experiencing their best year since 2005, ranking first in growth out of the top 25 U.S. markets for hotel performance, according to a survey by Smith Travel Research. 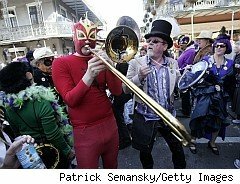 New Orleans' officials said the city's return as a top tourism mecca is the result of years of hard work by hoteliers and restaurateurs to persuade travelers that the area is in good enough shape to merit a visit. "We must continue the momentum because tourism, a perception driven industry, does not just happen," said Kelly Schulz, vice president communications and public relations for the New Orleans Metropolitan Convention & Visitors Bureau. The convention bureau "has had only a few minor cancellations due to the oil spill," she added, "so we are working hard to clarify misperceptions and let visitors know that the visitor experience in New Orleans is unchanged by the oil spill tragedy." Other popular tourist spots in the Gulf, however, are not so lucky. A study released this month by the University of Southern Mississippi found that the spill could result in an $120 million loss in non-casino tourism in that state's coastal areas. Meanwhile, low-fare carriers dominated Travel + Leisure's list of best domestic airlines, with relative newcomer Virgin America in first place, followed by JetBlue Airways in second and Midwest Airlines in third. The survey results, based on responses to a poll from December through March in which 16,000 readers were asked to rank various tourism venues and services, also included the world's best city -- Bangkok -- the world's best hotel -- Oberoi Vanyavilas Ranthambhore, India -- the world's best car rental agency -- Hertz -- and the world's best destination spa -- Rancho La Puerta Tecate, Mexico. Crystal Cruises, ranked by readers as number one in the Best Large Ship Cruise Line category, and Singapore Airlines, ranked number one among international airlines, both held onto the spots they've dominated since the survey began in 1996. A full list of winners, including a "20 to Watch List" that singles out new hotels and resorts, will be available in the magazine's August issue.